Despite the negative publicity affecting parks with orcas and dolphins, Loro Parque is still one of the top attractions on Tenerife. Whether it’ll make your list of Tenerife things to see depends on how you feel about animals in captivity. Loro Parque provides 135,000 square metres of sub-tropical gardens, including 7,000 palm trees, filled with exotic birds and wildlife. It boasts the biggest and most diverse collection of parrots ever assembled in the world; the biggest artificial iceberg which is populated by penguins; and the biggest dolphinarium in Europe. Add to that orcas, gorillas, tigers, flamingos…the list goes on. Tickets are €34 for adults and €23 for children (6 to 11 years) and include entrance to all the shows. The real heart of the town, the yam fountain and Indian laurel trees of Plaza Charco are where the Portuenses gather after work, on holidays and on Sunday early evenings to meet with family and friends, see and be seen. Originally prone to flooding at spring tide when shrimps would be deposited by the retreating waves, its full name came from its original title of Plaza Del Charco de Los Camarones, the plaza of the shrimp pool. The Plaza still takes a central role in many of the town’s biggest celebrations from Carnaval when a stage dominates the port side, to the July Fiestas when a miniature version of the old harbour encircles the yam fountain. The restaurants that surround the plaza buzz nightly with diners and the bar/restaurant within the plaza itself is a favourite place for some serious people watching over a cocktail or a jug of Sangria. 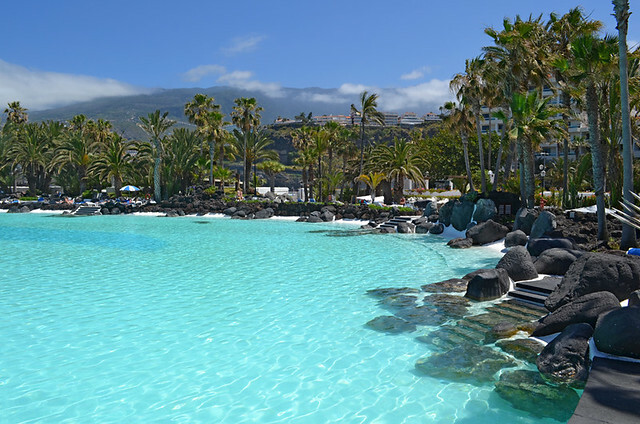 Designed by Lanzarote-born architect César Manrique, the swimming pool complex of Lago Martiánez is like the setting for a James Bond movie. Seven pools, including a 15,000 square metre artificial lake which has an island in its centre, below which is housed the town’s Casino, are set around tropical gardens, cascading waterfalls, foot bridges and sun terraces. Populated by Manrique’s sculptures, the complex includes bars, restaurants and snack bars as well as kiosks for ice cream and sweeties. By night, the pools are lit from below and lights sparkle in the pathways creating the stunning entrance to the Casino. Eat your heart out Daniel Craig. Entrance €5.50 for a full day including sun lounger and free wifi. 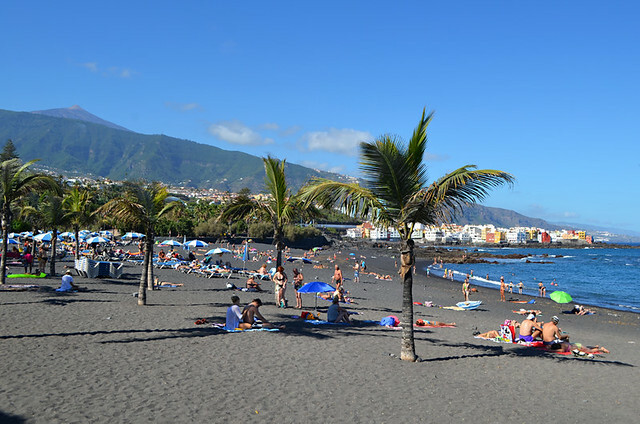 Puerto de la Cruz’ main beach was also designed by César Manrique and provides one kilometre of fine black sand which runs from Punta Brava opposite Loro Parque, to Castillo San Felipe at the west end of the town. Backed by extensive gardens, including a large cactus garden, the beach gets high rollers most of the year which provide endless amusement to those brave enough to face them when the red flag isn’t flying, and to the rest of us from the comfort of our sun beds. A self-service restaurant provides a reasonably priced range of food and drinks and there are shower, toilet and changing facilities. 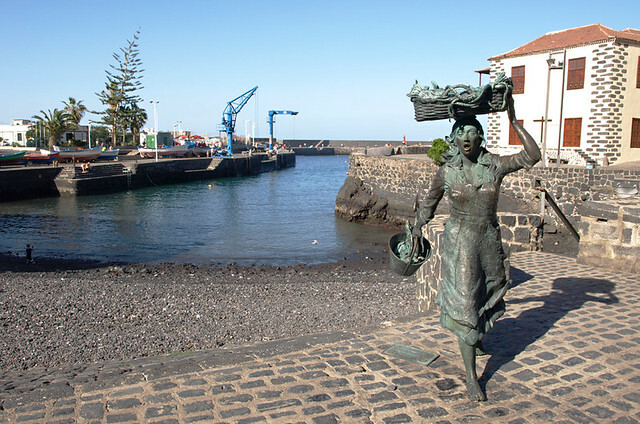 Puerto de la Cruz developed originally as a port for the wealthy town of La Orotava, exporting sugar and wine to the New World. 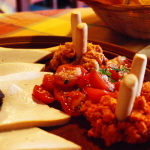 From its establishment in 1506 until its independence from La Orotava in 1651, it was known as Puerto de La Orotava. Today, the harbour remains a centre of activity with brightly painted fishing boats bobbing on its surface and berthed on the pebbly shore. Food stalls line the side of the harbour wall serving wonderful, traditional Canarian food and filling the air with the succulent aroma of paella as it sizzles in a giant pan next to the fish-laden tables. At fiestas such as the July Fiestas and Carnaval, the harbour side fills with drinks stalls, hot dog vans and churro bars (sugary doughnut fingers) thronging with revellers. Twice a year a large fairground fills the lower car park at the side of the harbour, and once a year the circus comes to town. Taking pride of place at the top of the pebbly beach is the bronze statue of the Fish Wife, local artist Julio Nieto’s wonderful depiction of a woman in full stride with a basket of octopus on her head and a bucket of fish swinging by her side. A favourite spot for selfies, she is regularly the centre of lens attention. Alongside the harbour is the lovely former Customs House, Casa Aduana, which dates back to 1620 and now houses the Tourist Office. In the picturesque and appropriately named Plaza de la Iglesia (Church Square) opposite the Monopole Hotel is Puerto’s main church. 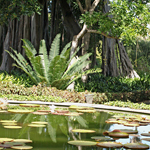 Dating from the 17th century, its interior is amongst the most beautiful on Tenerife. Originally built by the English in the late 19th century, the former Casino and Hotel Taoro is perched in 100,000 square metres of gardens on the site of a volcanic cone overlooking the town. 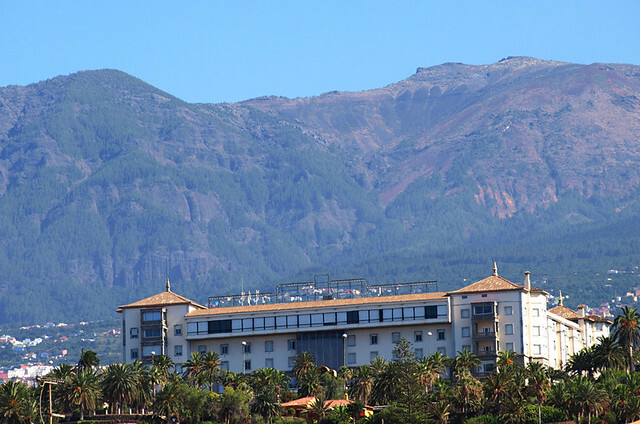 Views from here allow you to see the whole of Puerto de la Cruz laid out below you and you can reference everywhere by the two main plazas of Charco and Iglesia with their oases of palm trees. In front of the hotel a vast waterfall cascades down through abundant terraces behind the view point and there’s a genteel café which serves lunch and drinks with a view. 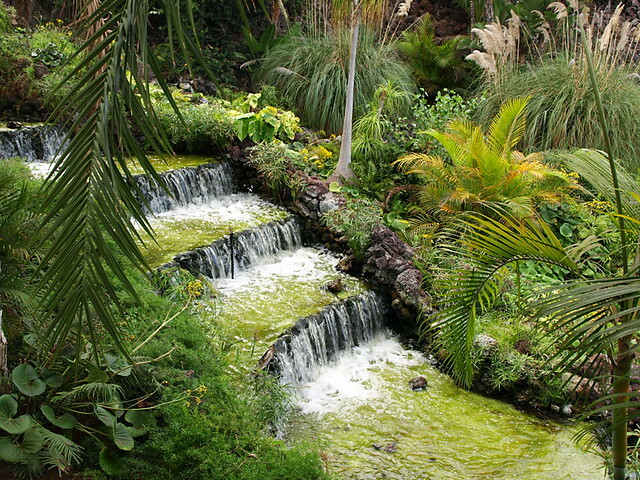 Behind the hotel, paths meander through lizard filled rock gardens, cactus gardens and tree lined avenues providing a paradise for joggers and strollers. In its heyday, Hotel Taoro attracted such notaries as Sir Winston Churchill and Agatha Christie. Today rumour has it there are plans afoot to restore it to its former glory as a five star hotel and spa but the first cornerstone remains to be renovated. Meanwhile, it continues to dominate the town’s skyline like some grand dame overseeing her great grandchildren at play. Housed in the town’s fishing district which is known as La Ranilla and is also the restaurant district, the archaeological museum is a bit pottery-heavy for our liking but its redeeming feature is its Guanche mummy. 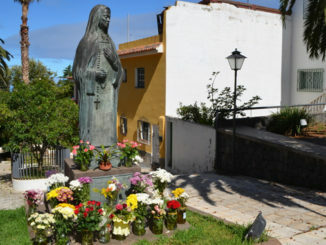 Inhabiting the Canary Islands for centuries before they were conquered by the Spanish, the Guanche were a primitive people who worshipped the sun and mummified their important dead. Mummies are exhibited all over the island, the best of them being in the Museum of Man & Nature in Santa Cruz but this one is housed in a mock cave viewed through a small crack in the ‘rock’ which gives it a nicely macabre aspect. 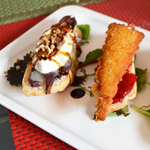 Discover the best of Puerto de la Cruz with the Real Tenerife Town & City Guide. This mini guide features two walking routes, one town and one garden route which covers all the locations described here along with many more Puerto sights and gives details of their opening times and entrance fees. 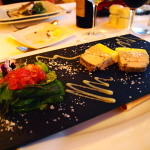 As well as having easy to follow directions, the guide is full of information about the town and includes recommended ‘refreshment’ stops and choice restaurants. Available online and sent to your email address in PDF format for you to print at home.